Different types of enclosed litter trays are becoming more common. 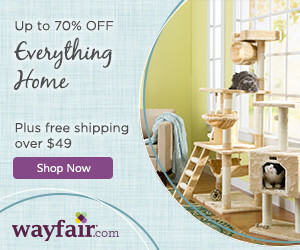 Years ago you might only have been able to buy the open cat trays in your local pet store. But with the number of indoor only kitties rising, their humans are looking at different ways of housing the dreaded cat litter box. 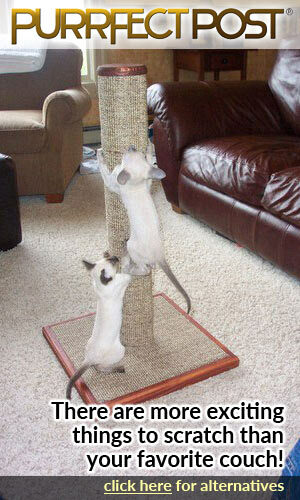 An enclosed litter box that is becoming more popular is the top entry litter box. 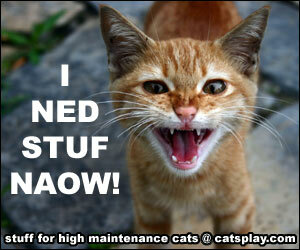 Well, many people live in apartments or smaller houses that do not have a large amount of space to store cat toilets. Quite often, the kitty litter box is stored in a utility room or spare toilet – or even in the main family bathroom, depending on space. This means that visitors can see how you keep your litter pans. But it also means that children and dogs can also get into the litter box. Thus making this a bit of a health hazard. I have no idea why dogs feel the urge to eat and snack on kitty litter but some dogs seem to like this extra snack. Why the Popularity for the Top Entry Litter Box? So enclosed litter boxes have become popular over the years as people feel they stop others seeing your cat’s daily ablutions. They are also supposed to cut down the kitty litter smell permeating through the rest of your house. Top entry litter boxes are a form of enclosed litter tray. But instead of your cat entering through a hole in the side of the litter box, they actually enter through a hole in the roof. This is therefore meant to cut down litter tracking and stop your other pets from getting to the cat litter. In my case, I have a cat that loves to dig in her litter. So much so that she often throws the litter out through the entrance of a covered litter box. With a top entry litter box though it is very difficult for a cat to throw their litter outside onto the floor. Plus it means less litter “accidents” as your cat has no entrance to urinate through. A previous cat that I had used to do this. She used to get completely inside the litter box but her bottom was slightly outside. So when she urinated the urine ended up outside the box. Keeps kitty litter odors inside the box and not permeating your house. Usually takes up less space than open cat pans. Stops children and dogs getting to the cat litter easily and providing a health risk. 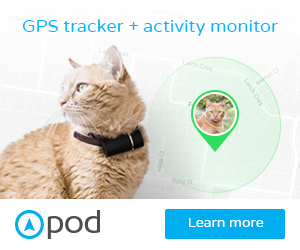 Keeps your cat’s pee and poop away from guest’s eyesight. As you can see a lot of these pros are very important if you live in a small house or apartment. Not everyone wants to see the cat box when they come to visit you. And it also means that clean up is a breeze as you will not have cat litter all over your floors and you should have had no urine accidents. So far this all sounds great but there are some cons to top entry litter boxes as well which you need to think about before deciding whether this fits you and your cat’s needs. Security. Cats feel at their most vulnerable when they are in the litter box and a top entry litter box therefore, gives them just one means of escape. Odor remains inside the litter box which means that because your kitty has a very sensitive sense of smell they might not enjoy using the litter box. Slightly less agile and older cats might find it difficult to jump onto the covered top of the litter box and then jump down into the litter below. These cats then might find it tricky to get back out of the box. Litter takes longer to dry in a covered cat litter box as there is less air circulation. 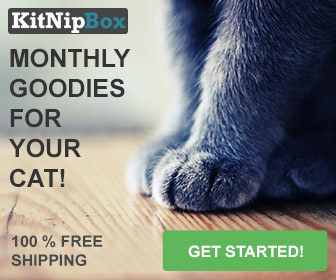 Smaller box so your cat might feel a little cramped. Personally, I have used covered in litter boxes for my cats for about 20 years and in that time I have had no issues with cats refusing to use the litter box. I have though kept them in a quieter part of the house which does allow my cats to see everything coming down the hallway. Therefore, I feel that they do not feel trapped as they can see if anyone is coming down the hallway. I did try an open litter box when I moved house but one of my cats completely refused to use it and instead used the covered box. With top entry litter boxes your cat can stick its head out of the roof whilst it is urinating and therefore see everything that is happening outside the box. But in order to do this your cat does need to perform its’ ablutions in one place. It is also feasible that as you cannot see poop or pee then people may forget to clean out the cat litter box very regularly. This then increases the odor in the litter box which may put your cat off from using it. This though is easy to remedy by just remembering to regularly check and scoop out the litter box. I do think that arthritic and older cats might find difficulty in accessing a top entry litter box. It might be difficult for these cats to actually leave the litter box as they have to climb through a specific smaller hole. But you can remove the roof lid to see if this makes a difference. However, these litter boxes are very good if you have a small house or apartment. They do take up less space usually and you can almost hide what they are. Overall, though I think that even though there are some cons against top entry litter boxes, most of these issues can be overcome. It is definitely down to your cat’s personality. If you have lots of children and other pets rushing up to the cat litter box all the time when your cat is in there then yes, of course, your kitty is going to feel less secure. But put the litter box where there is little foot traffic and where your cat can get a field of view. Quite often when you introduce a new litter box into the household you do need to give your cat a bit of time to get used to it. So, for example, you might need to put a little litter from an old litter box into the new one so that your cat can get used to the smell. Interested in seeing more about Top Entry Litter Boxes? 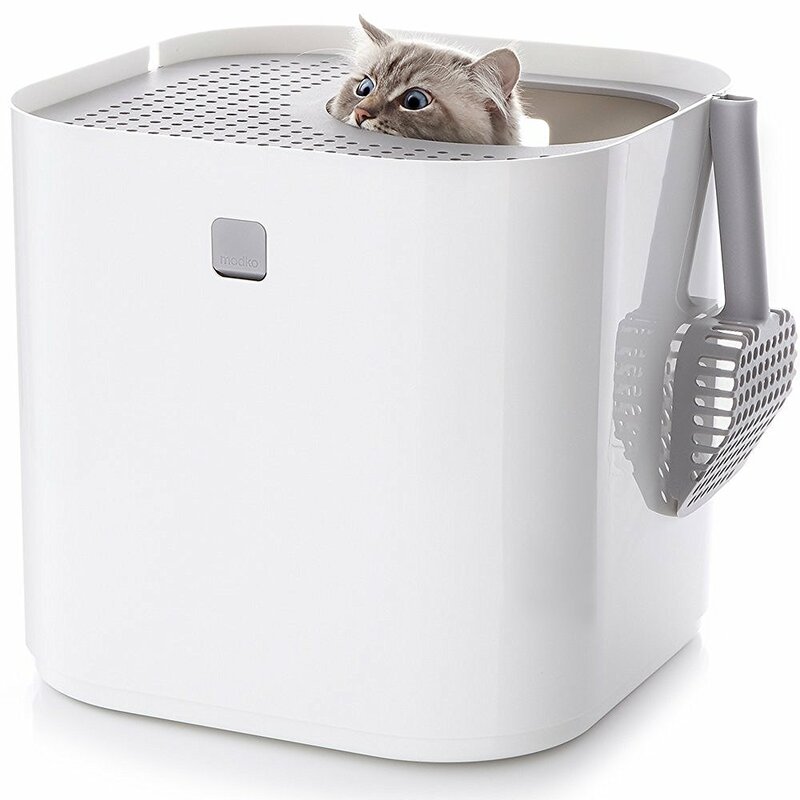 Then Look at our list of best top entry litter boxes here. That’s a great idea! Never thought about using a cat litter with an open top lid. We’re using an open pan for our cat and even though the pan’s been cleaned out, you can still smell the litter in the house which is frustrating at times. We place the cat litter box in the second bath where it’s more private than the other rooms. My grandson is the only one using that bath and is gone a lot to work or with friends. Very cool site! I love the picture of the kitty in the litter box too. Adorable! I grew up with a cat but now we have dogs. However, earlier in the year I stayed a friend’s house and had to take care of her cat. Sure wish she had a Top Entry Litter Box! She had a traditional one and I found it very difficult to clean up the stuff in the box without making a mess in the kitchen.